It’s that time of year again, dark afternoons, howling winds, lashing rain and roaring fires. This time of year, like most people I guess, I am drawn to comfort food. 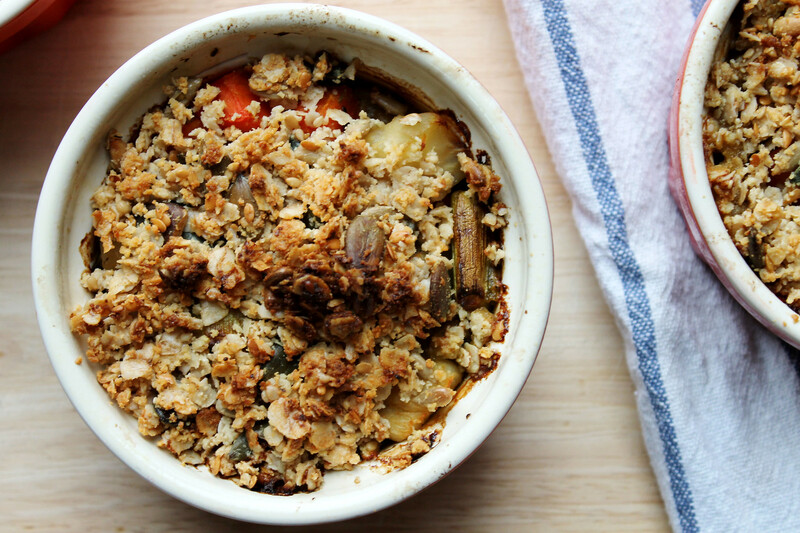 If it can be baked and topped with a crumble I’m in, and so this winter vegetable crumble came about. 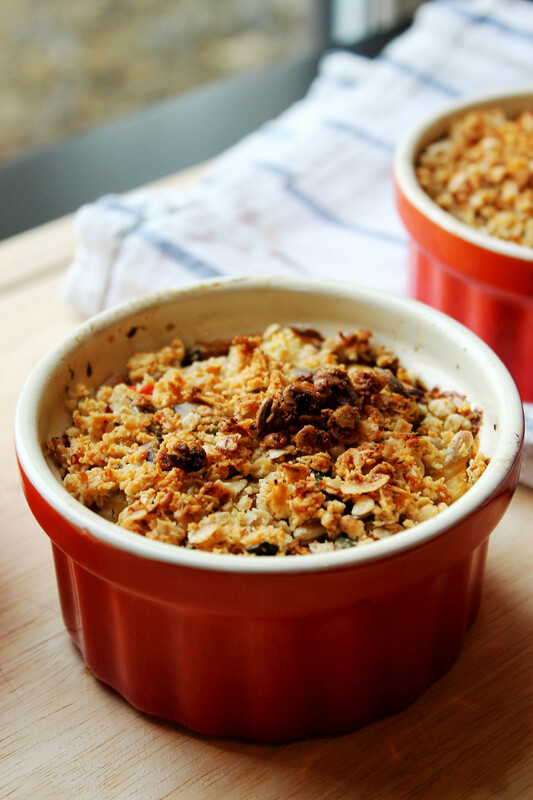 I love my fruit crumbles – like this Oaty Rhubarb Crumble but when I was wondering recently what to do with a celeriac I had I decided to try out a veggie version. 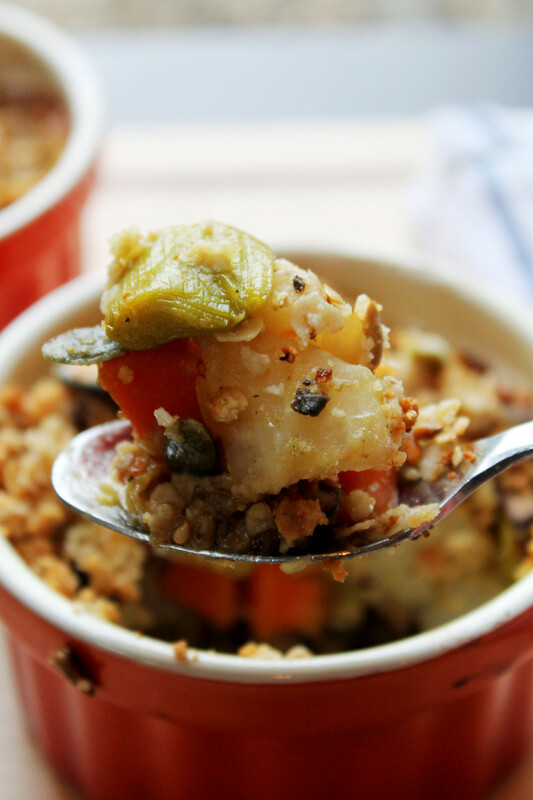 This winter vegetable crumble is really tasty, can be made in advance, freezes really well and is hearty enough to be the star of the show but is equally as good on the side of some roasted meat or oven baked fish. It’s also a great way to use up those semi wilted veg we all end up with in the fridge so this particular winter vegetable crumble incarnation includes leeks and mushrooms as that’s what was floating around at the time. Any root vegetables will work really well in this crumble though, I’m thinking carrot, parsnip, red onion and brussels sprouts as Christmas approaches! Note: I use coconut oil here to keep this dairy free, however you could easily use butter. I love the flavour the coconut oil brings to this though. Pre heat your oven to 180C (Fan) and get a suitable baking dish. I used individual ones here but any glass oven proof dish will work. Dice the celeriac and carrots (to about 1cm square). Steam or boil for 15 minutes until no longer hard but keeping their shape. Finely slice the mushrooms and leeks. Add the coconut oil to a medium-hot pan. Sauté the mushrooms and leeks until softened. Season the mushrooms and leeks with salt and pepper to your taste and then add the rest of the veg to the pan. Give it a gentle mix so that all the veg are combined and then pour the mixture into your baking dish. Get the crumble topping ready. In the same pan, melt the coconut oil and remove from the heat. Add the seeds, oats, almonds and herbs and stir until they are coated well. Pour this mixture over the vegetables, covering the whole lot. Pop it in the oven for 30-40 minutes until golden brown on top.